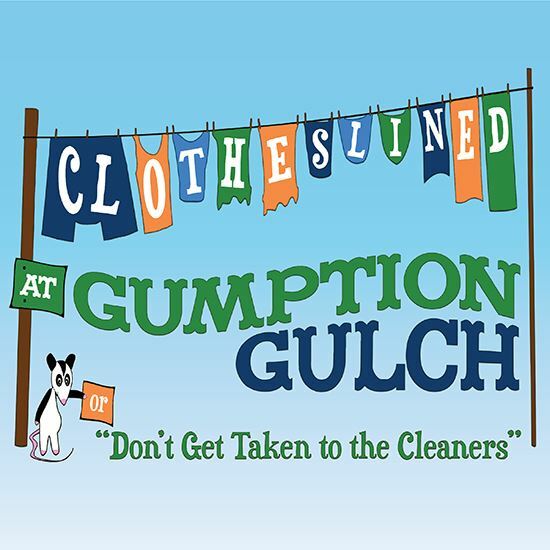 Hard times have come on Gumption Gulch and Grandma Gertie Parker is forced to open a clothes-washing service to earn extra money. Even Sheriff Gideon Gumption is “moonlighting” (though the term has him totally baffled) at the stagecoach office and a local lunch spot. Grandma Gertie’s old nemesis has sent her two boys, Luther and Ulysses Bragg, to town to put Gertie’s laundry service out of business as payback for an old feud. Add in a possum-farming brother and sister couple (Elrod has a serious case of “the anxieties”), a blacksmith who dreams of being a comedian, a crazy wandering minstrel who sings what he overhears (and has his own secret), and the confusing love interest between the Sheriff and Gertie’s granddaughter Chrysanthemum, and you have the makings for a hilarious story. The wisdom of “Daddy Cadwaller” at the end will leave the audience laughing and pondering. Full evening. A: Some of these characters were birthed out of a series of sketches created for a kids camp. From there, I wrote (at the urging of my wife) a Christmas show called Christmas at Gumption Gulch. This show was written because the Christmas show was such a hit and people wanted to see more of the characters and setting. A: Having also directed the premier of this show, I must say that it would have to be the confusion on the part of Sheriff when Zeke 'falls in love.' We had a great time laughing our way through those lines. A: Most characters I write have some connection to a real-life person I've encountered. The best inspiration for outrageous characters begins with someone you've met. For instance, several lines came from a Walmart cashier. I was on a writing break and encountered this colorful person who helped me with the next level for a character. A: Fun with a moral. Daddy Cadwaller's wisdom of "Never miss an opportunity to shut up" allowed for many cast conversations (and we heard audience members talking about it afterward). So many times, we hold on to offenses from so long ago that we forget why. Perhaps it's just time to let it go.